I don't think this film was ever made. Or may be it was made but never released. Strangely enough there was a record available a few years back with all the songs. 'Hogaye kiun hogaye' is a wonderful song. Anybody knows who this Nutan Sahay is? Strange thing is that Nutan Sahay's voice is so much like Sabita. Is she real or is that Sabita singing under pseudo-name ? Another strange thing ! The malayalam film 'Madanolsavam' was dubbed in Hindi. It's called 'Dil ka saathi dil' and It has a beautiful song 'pyaar mei.n jo bhi' sung by Jesudas and which has the same melody as 'jaane raaz kyaa hai' from 'Kuhasaa' ! So we end up with two hindi songs with the same melody. Same thing happened when another Malayalam film called 'Chuvanna Chirakkukal' was dubbed in Hindi as 'Daisy'. 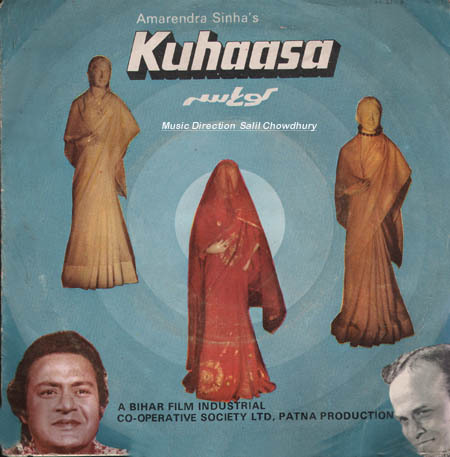 The songs were dubbed as well and as a result we have ended up with two hindi songs with the same melody. 'Man kare yaad wo din' by Kishore from 'Aakhiri Badlaa' is a superb song but it's clone 'BichhaD gaye saathi mere' by Mahendra Kapoor in 'Daisy' is a very bad copy with very bad singing and very poor lyrics. All I can say is that Salil was busy spinning complex spider webs of songs in different languages and I am now struggling to create this cross-reference !